Nos Clients Heureux ont signalé*: Une taille améliorée, une meilleure posture et satisfaction. 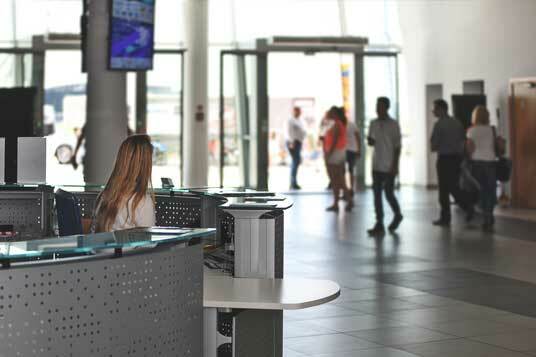 Les témoignages ci-dessous sont des exemples de résultats obtenus par des utilisateurs réels. Des photos réel d'avant & d'après de nos clients satisfaits qui ont amélioré leur taille et leur posture. Les résultats ne sont pas typiques. Les résultats individuels peuvent varier. Les résultats ci-dessous sont tirés des sondages d'utilisateurs Growth-FlexV® Pro réels. Motivez et encouragez les autres avec votre histoire! Nous vous invitons à partager votre histoire de réussite et à nous dire comment le Systeme Growth-FlexV® Pro ou l'un de nos produits font une différence dans votre vie, chez celle d'un être cher ou quelqu'un que vous connaissez. Il est facile de faire une soumission d'histoire. Envoyez simplement votre histoire à notre équipe de support. Aucune histoire n'est trop grande ou trop petite et les histoires du cœur sont les meilleures. S'il vous plaît ne pas ressentir le besoin d'être formel ou de vous inquiéter sur vos capacités d'écriture créative. Les témoignages de nos clients sont conservés dans leur langue d'origine. N'hésitez pas à soumettre votre histoire de réussite aussi. Cliquez ici pour nous contacter! Hi I am Mahyar. I have been doing lots of exercises and diets since far I remember. I never could reach to the height that satisfy me. After trying heaps of useless products, I finally saw my results after using Growth Flex. I have actually grown 4 cm after 3 months which really amazing. I am still taking this growth system and I am sure by the end of this year I will have my dream height. I have to say than you so much for your fantastic product. Hi its ben amushan let me tell you that first of all sinotech is the best company ive seen it is truly that good. these are the reasons 1. always reply to emails doesn't matter what ques you have they will help you get taller and give you what you need to grow taller 2. i have heard so many things about this company and when i first went on the website i was amazed at how many test. there were of people who grew and proof with pics too 3. you can start a real buisness with sinotech and even become a millionaire one day and who these days could you do that with its just an smasing company and thanks to Danny becasue he has been there with me giving me answers and alsways reply very quickly while other growth companies dont even reply at all now what does that tell you. i just love grow flex soooo much!! 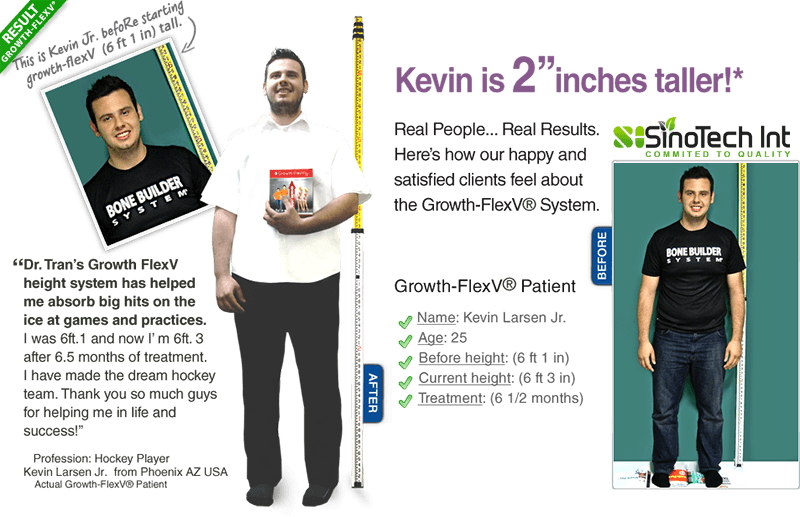 I would like to thank Growth-Flex V for helping me grow 7 cm in 3 months. In the morning when i wake up i feel rejuvenated and full of energy unlike before taking HGH boosters. When i exercise i have more energy and stamina like when i was a teenager, from the first day i could feel the huge difference it had. I have recommended HGH to many of my friends and will continue to use your product. I am very happy with my results from Growth Flex Ive only been using the product for a month and I have gained one inch. I have more than the one month supply, but I would recommend this to anybody. Dear Growth Flex Representative, I am contacting you regarding the Order ID No: 759-715SX and would like thank you for sending it. It is a really fast customer service. Now I want to know further about usage instrcution and how to use your nutrition. This mail I am writing to you to say A BIG THANKS to you for helping me out to get my order. If you had not intervened, I dont think it would have been possible to get my order. You can just imagine Sir I ordered back in September and was thinking I would now never get my order as also shipping department was a bit annoyed as they said they sent two orders to me....but luckily due to your intervention and timely followups, I have finally got it. Dear Sir, as I did not get your product in time. I started another height therapy program hxxxxt.com from our country India only and so I dont think that I should take Growth Flex at the same time...So I will not take it for two or three months. I dont think the Growth Flex gets expire by that time. But in the end THANK YOU SSSSOOOOO MUCH for understanding and helping a harried customer. My name is Ray. I have been taking Growth flex system for 3 months now. I feel that the supplement is not only a height increse product but an over all body stimulant. I feel really good through out the day, full of energy and always looking forward to the end of the day to get my exercise in. I have only grown an inch but i still have another month of the supplement to go and i hope i can turn that inch into 2 or 3. Until then i just keep in mind that effort equals results. 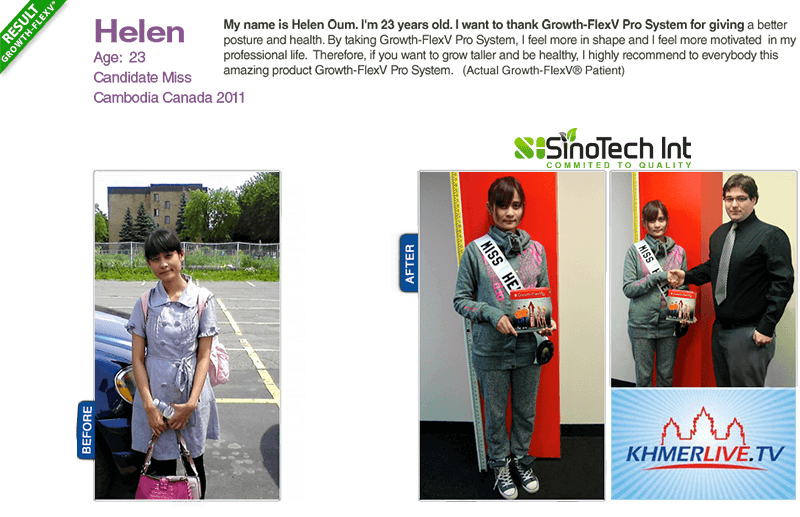 This testimonial is for growth-flexV System as Im very satisfied with your growth system provided to me few years ago. My sefl esteem was very low in the past and I was always thinking that I was the smallest person on earth since evething was blank in my life and nothing was helping. I used your system and followed the instruction and gained mazing results such as self confidient, better postuer and mainly my improved height. I think no more about my height and being short is now a history that I do not even think of it anymore. You solved my life biggest problem and god bless your team for helping me as I can now have better lifestyle, going out with friends shoulder to shoulder and having a happy living. My best wishes for helping me! I would to state that growth-flex system has improved my posture and sleeping habits greatly which have resulted in enhanced muscle growth as I work out regularly lifting weights.The increased HGH levels results in reaching your fitness goals in minimum time. I don't know anyone else who will believe that it would be possible to increase height. I don't need any explanation for that because I myself experienced it. I grew 2 inches in two months! and I am still growing. My uncle met me this year and remarked that I had grown. My strength has increased. O yeah and I am damn serious, I experienced in my workout. I reallly don't believe. Actually I feel sorry for those who don't know about this product. I'll actually recommend this to my aunt. This product was a god send. Man, now I beleive everything is possible except for dribbling with a football. Hi , my name is Khalood,I want to say thank you for that wonderfull product ,I am so happy that I gained 2 inches just for 16 weeks .My all wishes come to thruth,I am so happy,Now I ordered again. A HUGE thank you to everyone at height boosting for making my dream a reality, I’ve always wanted to be a few centimeters taller than what i was and became skeptical when searching the internet for information about the topic. Eventually I stumbled across your site and was still skeptical but your money back guarantee enticed me to try it out, to see if there was any basis behind my skepticism. I got the package and took it like instructed, after 3 weeks i, re measured myself and shocked i saw an increase of 2.2cm of height. Thanks for a product that finally works! I am Farhod, do you remember me? This is my another e-mail adress. I want to express my gratitude for sending Growth Flex. I really appreciate it. You can't realise how I'm happy. I got the preparate, and this is one of my best days of my life. Thanks a lot. By the way, I wanted to ask you, I read the letter that was sent to me with this product. And there was written something about free bonus exercises. IS that true? I can get free advises or something like that? Once more thank you very much. I'm looking forward to get a message from you. 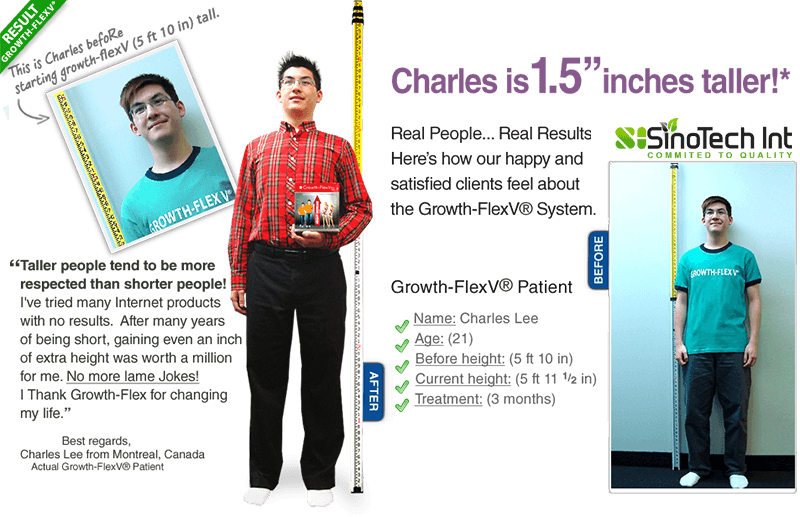 Hello, My results from the first period of taking growth flex system was, my original height started at 5"5 and a half and i am currently 5"7. I am very pleased with the results of growth flex and could really feel the difference it was having on my body. Unfortunately I had dislocated both my shoulders as a teenager and have tried many products to provide strength to build them up. Growth flex really worked but the symptons i suffer with my shoulders is starting to creep back, as I have finished the course of growth flex I had previously ordered. To Whom This May Concern, This is to inform you that i have placed a new order today for a one month supply of Growth FlexV system. I have personally tried the product myself and it has helped boost my height from 5'5 to 5'7 which is why i m now buying it for a friend. I would appreciate if you can send me a confirmation email regarding my order. I am going to try another 3 months of you pills. Hi there, I have ordered the 3 months supply of heigth boost system/supplements. This is my second order. I am satisfied with the supplement when my son tried it. Just I want to know how I could get the bonus for my first order. I HAVE RECEIVED MY GROWTH-FLEX PACKAGE AND I AM VERY THANKFULL FOR ALL THIS EFFORT YOU HAVE OFFER ME WHICH I APPRECIATE IT SO MUCH . PLEASE FEEL FREE TO CALL ME FOR ANY SERVICE YOU COULD NEED FROM KUWAIT . AND THANK YOU AGAIN . Thank you. SinoTech is an awesome company. Thank you very much ken, your a life saver man, you really treated me with the best kind of care i have ever come across. Your are saint man, because there are too many good people like you who would help someone young, low income, and a college student like myself. Ever since i stopped using the item the nauciousness has worn off a quit a bit so i guess i had some type of allergy to it because i would always feel heavyness in my chest and would feel sick. Thanks again man and may you live to be 100000 years old for your great efforts and generous behavior, and for really taking care of me. I will be awaiting for your confirmation, you should recieve the stuff in another 2-3 days, im positive. . I am using heightboosting system for 4 month already . I use to measure myselve every week and couple of days ago noticed 2 cm of growth[i use to be 1.63. ].I also do make a back stretching exercises . Because relying on the testimonials of your product i expected to grow a little bit more. Hi there, I am using ur product for last 2 months now. After 2 months I measured that my height has increased around 1.3cm. I am happy to see that at least this product is working, unlike the previous products I used. I have another 2 months capsules left. After 2 months of using that if I see my height is still increasing, I'll order for another 4 months product. I do a lot of excercises. Please let me know if there is any other factor (like, diet) that can help to increase my height. I did receive a refund, thank you. Can I ask why I was unable to purchase your product? Are you out of supply? I am happy to find out that the first item I ordered off the internet was actually not a scam. I am 21 year old from California and I would like to say that this product is probably one of the best I have ever tried, I tried all the other exercises and they did not work this is definitely the best. Thank you very much for your impressive service. Hi, I have received the 3 pack Growth system product via Canadian Air Mail. I was extremely excit'd & have begun using it for last 7 days. Things..i noticed..so far im feeling an abundance of energy..my body aches have disappeared..emotionally im feeling great..good sleep. Im waiting for these booster's to pep up my growth..Even 1.5-2 inches ht increase i would call it a success..and order more. PS: Later,I want to take up Disribution of your products(India)..and cite my case in advertisements. After a month of treatment, I saw some differences. When I woke up the morning, I feel much taller than at usual , and it looks like it do this more and more each morning. But, I did two days of weight trainning and now I didn't get the same feeling, so, I would like to know if it was a good sign and a sign that happened when the growth started. Is the treatment efficace for everybody, that we gain approximately 3 inches(if Im in my growth phase with a good stretching/free weight trainning + a very good diet) could you answer to all please!! hi i have been using ur product for 2 months so far, and am currently on my last bottle(3rd month) i have only grown half an inch and was wondering now im on the 3rd month will i grow any more, and can having already ordered 3 bottles, Can i order more-? I am Terence from Malaysia. I have planned to buy growth flex pills since I saw my friend has obviously grown taller 1 month after taking the pills.Anyway,I have no idea about how to make the payment. Also,3 months supply might be too expensive for me,may I know if I can get any discount for 2 months supply? Last question,I am not sure if my friend was purchasing the pills from another company because he just told me he was buying grow-flex from Canada,I am not sure if there are other companies has similar product name. I've received the package a couple days ago. I just want to say thank you for your effort. It's been the best of service here, and I'm very pleased. I will for certain return for more packages and hope to receive them all like this time Once again thank you for your package and your service!